We were born to move. It's good for us, physically, mentally, spiritually. When we move, we feel better. When we don't, we literally atrophy – physically, mentally, emotionally and spiritually. Life is a constant balancing act, navigating both obstacles and opportunities. When we move we practice becoming nimble, open to change and more comfortable in our own skin. We turn our attention to the body which becomes the object of our meditation and move to our own rhythm, with no rules or steps to follow, to discover what is really happening inside, to leave behind what no longer serves us and find our way to our centre. 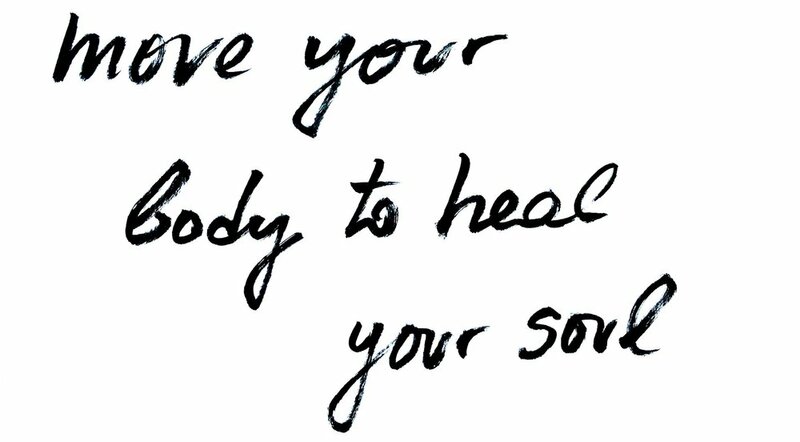 We move to the catalytic impact of the music, we exercise the body, sweat, peel back layers, release and fill up again, reaching a state of clarity, strength and stillness. Open Floor Movement Practice is a dynamic moving meditation practice, it is mindfulness in motion, a practice where we learn to track thoughts, stories and patterns that hold us back and turn them into creative fuel. Using universal movement principles, such as breath, grounding and centering, our aim is to become more embodied or at home, for this beautiful ride of life, present for anything and everything – loving, losing, learning, creating, colliding, connecting. Open Floor is a movement meditation practice for building muscular and emotional intelligence, mindfulness and soulfulness. We cultivate the forces that fuel our creativity, our connections and our ability to change, which we all know is the only constant in life. Our vision is to build a world where conscious movement ignites creativity, community, social justice, health and well-being. The weekly Open Floor classes are open to all. No experience in dance or meditation, movement or therapy is necessary. Each week we explore a different theme. We move with a very warm community that welcomes new members in a safe space for exploration. Our 2019 schedule will be announced shortly. Wear comfortable clothing and bring some water. We move barefoot or with special dance shoes. If it's your first time, come a few minutes earlier. Please make sure to drop by the Alumni Association offices on the ground floor before joining us in class. Drop-ins are welcome! Workshops allow for in-depth exploration of specific thematics and offer an immersion to the movement practice cultivating the ground for change. Depending on the theme and purpose, workshops are half-day, day-long or weekend offerings -especially as part of retreats. Combining Gestalt and body psychotherapy, conscious dance with sound and live music, Journey to the Heart is a workshop leading us on a journey across the wilderness and beauty of our personal landscapes, back to our roots, our body, our heart. We wake up the body to experience its sensations, opening our heart to reach connection with ourselves and others. Using core movement principles, mindfulness, systemic psychotherapy thinking and the catalytic impact of music, we work together to create custom moving meditation sessions and workshops that help strengthen team bonding, unlock group creativity, and support workplace wellbeing. An innovative and effective away to bring more movement, creativity and engagement to your team. We have facilitated moving meditation sessions for Piraeus Bank, Google, Quest Holdings, World Profile Group, One Level Up conference, Organosi Gi and others.